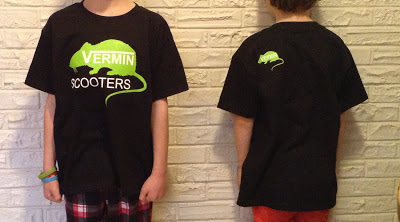 Vermin Scooter Shop: VERMIN SCOOTER T-SHIRTS HAVE ARRIVED!!! Picked them up today, they look great. Sizes from KIDS XS to ADULT XL (for really big scooter riders). You can buy 'em here: T-SHIRT or come by the shop (check our hours).